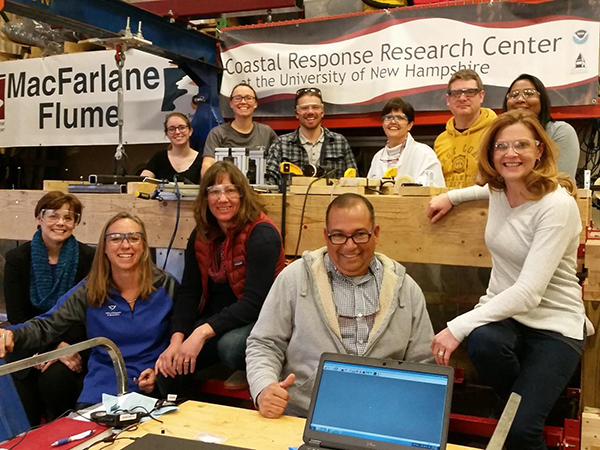 MARCH 29, 2019 — This week, leveraging our longstanding relationship with the Coastal Response Research Center at the University of New Hampshire, OR&R’s senior scientist collaborated with researchers from Woods Hole Oceanographic Institute, the Environmental Protection Agency, Water Mapping LLC, and Sea Scan MK2 ECA Group on a project to calibrate various sensors under development for detecting and characterizing oil in the water column. The collaborative team consisted of researchers from the University of New Hampshire, Woods Hole Oceanographic Institute, the Environmental Protection Agency, Water Mapping LLC, and Sea Scan MK2 ECA Group. Tests were conducted in a specially built flume (the MacFarlane flume, also known as ‘Florence’ or ‘Flo’ for short) built by UNH doctoral graduate student Missy Gloekler. The sensors being compared and calibrated can detect oil droplets, gas bubbles, and dissolved oil in the water column by measuring fluorescence, backscatter, and holographic images. These instruments can be deployed on remotely operated underwater vehicles, autonomous underwater vehicles, and for some, may be operated by hand shipboard. The research team tested several types of fresh and emulsified oils, with and without dispersants, to detect and compare a wide range of droplet sizes, and air/gas bubbles. These studies were a precursor to additional OR&R research and methods development work underway to use remote sensing and sampling tools for oil spill response and assessments. All participants contributed significant “in-kind” contributions, and serve as a model for demonstrating how leveraging limited resources can lead to significant advances in oil spill research. For more information contact Lisa.DiPinto@noaa.gov.